Mark Chapman, Osi Umenyiora and Jason Bell with all the best bits from NFL Championship weekend as the Jacksonville Jaguars travel to the New England Patriots. fire towards the end zone. 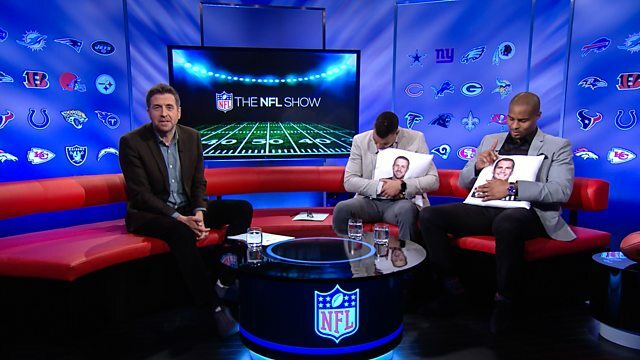 Hello and welcome to the NFL Show. which kind of upset these two. No place - no place in the world. Got to give you chills, man. a place in the Super Bowl. champions, the New England Patriots. it gives you a lot for next year. There is a trophy, isn't there? if you get anything as a player. a little trophy or something. to greater things for you. You know how it is, Mark. how it is with you, yeah! and it is caught by Marcedes Lewis! and Chung has to help. and he's in for the touchdown! Wow, take that, they say! with about five Patriots there. that is going to draw a flag. he's done for the half, for sure. the rest of this game. White in for the touchdown. prepared to give them their gaps. Make it, you got a seven-point lead. Patriots take over at the 44. Lambo from 54, look at that kick! Did he get the feet down?! in trouble, the ball is down. who got to him first. and it is knocked down by Gilmore! a great job, stepped up - oh! and that could very well do it. and Belichick knows he's got it now. 17 years, it's truly generational. Super Bowl wins with six. digits in a playoff game. at the stats they've racked up. they always find a way to come back. And you know what's even more crazy? that they're about to make a run. playing against them feels like? How long can it keep going for? they're going to be able to succeed. but they are a quarterback away. Would you keep him for next season? and what we're willing to pay. quarterback position in the NFL. out there and win games for you. can do that for them. You got to pay for that, Osi. pay for a couple of years. and the Philadelphia Eagles, then. for the fairy tale to end. the Vikings or the hometown Eagles? He's hit, and it's intercepted! The handoff is to Blount. and in for the touchdown is Jeffery! to earth, and the landing was hard. out in the NFC Championship Game. You're going to the Super Bowl, men! a bit of politics for you! since I felt like that! and I try to watch the games. I was sick, Mark, I was sick. I haven't called or texted anybody. Today I'm starting reaching out. be affected most by the defeat? cos they are my friends. it was a rough day for him. Do you think they targeted him? read option, it was all on him. see him trying not to laugh! Have you won the Super Bowl? little helmet catch or whatever. to happen to the Minnesota Vikings. like that - they were done. as you could possibly get. bombs like that all game? Obviously, I'm not a coach. your mother, your father, your kids! man, they ran into a buzzsaw. This is what football is about! comeback in Super Bowl history! A leaping reception for a touchdown! They lost to the Patriots. He is starting to run. And what a signing he was! something out of the hat. and found his feet, and his range. season and he take some stopping. the dy-nasty, against the underdog. to get our revenge on him. laugh at him for once! He doesn't want any part of this. but you know good football! a hard game to call. you've always got a chance. really matchup and play well. They are going to have to do that. up well with New England. and bring waves of people at them. they can run the football. against the favourite, won't they? It has worked for them so far. on the outside will be saying. going into the fourth quarter? be that far ahead at all. to come back and win! that is the advantage to me. with a fresh batch of guys. You've got to eliminate him. and you've got to cut it off. They had a potato sack race! Hoping to keep things hot! Oh, my god, no way! My vote goes to Tony Romo! That has to be Tom Brady. back as he does every single year. as they have done so far. I have to go with him, man. he's going to tell you the truth! Would you go along with it? I'm going with my man, Tom Brady. I mean, he is the best. He had a great year. You see what he did last week. to be in the Super Bowl? to Tom Brady this year. of games without Antonio Brown. I wouldn't have given it to him. but that statement, I agree with. the running for Pundit of the Year! Just on the basis of that answer! You know what you are good at! give it to that guy. what an MVP should do. Rookie of the Year for Kamara? with how he played football. I will, the Los Angeles Rams! OK, Team of the Year? Eagles, it has to be. to where they are right now. we do have an award. we need to make to win. This is a hostile environment. I've got to coach better. not to do, I did. so we can clear our minds. Just bad vibes and energy. Look, whatever they are, they are. car back in third gear. And some pizza for her class. he seems dependable in doing it. The Titanic still has to go. We are going to do a better job. discussions on here as well. is in a good way? and alleviate the pain points. When you watch the games, right? Nobody who is too big to fail. It doesn't happen in the NFL. Everybody has a chance to win. and give you a taste of festivities. get these shows to air. between me and that dog. You are watching yourself, are you? he was my wife's husband. Mark Chapman, Osi Umenyiora and Jason Bell with all the best bits from NFL Championship weekend as the Jacksonville Jaguars travel to the New England Patriots and the Philadelphia Eagles host the Minnesota Vikings. For the victors, a spot in Super Bowl LII awaits.